The FM was one of two compact SLRs introduced by Nikon in 1977 to compete in the consumer category of SLR systems with the Olympus OM line of cameras. The FM model was a fully mechanical body, with a TTL center-weighted gallium arsenide phosphide photodiode light meter that used Nikon's now-classic 60/40 percent center-weighted metering pattern. The auto-exposure counterpart to the FM was the FE, which had a match-needle light metering system,and a very accurate electronically-timed shutter that allowed either aperture-priority automatic operation, or manually adjusted match-needle exposure metering. Nikon, in introducing the FM, was responding to customer interest in a full-featured but compact SLR system. The FM was much smaller than the professional F and F2 line of Nikon SLRs, but retained the traditional rugged metal construction of its predecessors. Both chrome finished and black-finished FM bodies were made. The FM used a match-diode metering system with the then-new gallium-based photodiode system that was supposed to be better than the earlier cadmium sulfide or selenium-based metering systems that came before. To power on the meter, rotate the film advance lever so that a red dot is displayed, cover the dot to power off. It has a metering range of 1 to 18 EV (50mm f/1.4). The film speed can be adjusted on the ring surrounding the shutter speed dial. Lift up the ring and rotate until the desired setting is displayed. Film speeds can be set from 12 to 3200 ISO. The meter settings can be seen on the right side of the finder which has LED exposure indicators. When the small, round center red LED is lit, the exposure is dead-on to within 1/5 of an f/stop. When the center LED and either the + or - LED is lit, exposure was within one-half of an f/stop of recommended. When only the + or - LED was lighted, the exposure was off by more than a half stop. The focal plane shutter is a vertically travelling design with speeds from 1 to 1/1000 of a sec. and a B mode. Shutter speed setting can be changed with a knob on the top right hand side of the camera. 1/125 is marked in red as that is the fastest electronic flash sync speed. Flash can be used by mounting on a hot shoe as well as connecting to the PC socket. The shutter release button is able to use a traditional cable release. Not known by many people, the FM's metal-bladed Copal shutter unit would respond to incrementally turning the speed dial, and thus setting the dial between 1/60 and 1/125 second would yield an actual shutter speed of approximately 1/90 second. This feature was very useful, especially when shooting color slide film, and worked between all shutter speeds. The finder is based on a pentaprism design and has a 93% view. All FM models had a round eyepiece, threaded to accept a circular, rubber-bumpered eyepiece lens that helped keep dust from entering the non-interchangeable viewfinder prism. The finder displays the meter settings on the right, as well as shutter speeds on the left. Aperture setting can also be displayed on top, but is dependent on the type of lens mounted. 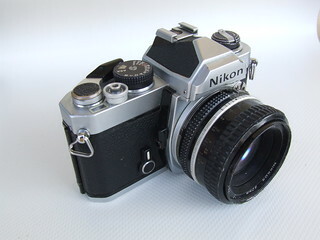 It did NOT feature user-interchangeable viewfinder screens, and was equipped from the factory with Nikon's then standard K screen, which had a centrally located horizontal split-image rangefinder, surrounded by a microrprism doughnut,with the balance of the screen plain ground glass with a very fine fresnel pattern that was virtually invisible. The K screen featured Nikon's fairly standard 12mm diameter scribed circle, into which about 60 percent of the light meter's sensitivity was concentrated, with the remaining 40 percent of the meter's sensitivity distributed across the outlying areas of the viewfinder's area. 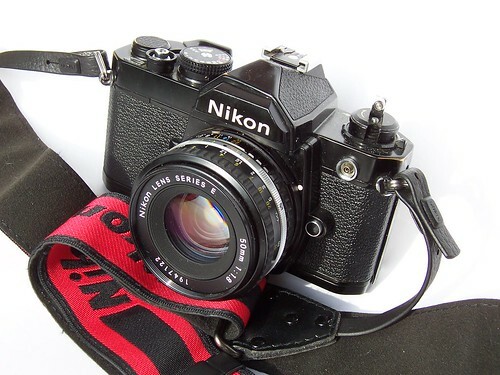 Although the viewfinder screen was not as bright as on some competing cameras, and was somewhat coarse by modern standards, the finder image was contrasty, and offered excellent focusing accuracy and repeatability using the manual focus Nikkor lenses of the era. Manually focusing lenses is easier on an FM than it is on most modern d-slr's, due to different viewfinder screen design parameters between the eras. The FM was designed to accept AI and AIS mount lenses, but can also accept non-AI lenses using stop-down metering. The FM was introduced in 1977, and since the conversion of the Nikkor lens lineup to Ai or Automatic Aperture Indexing was not fully completed at that time, the FM (and the FE) allowed for stopped down light metering with Nikkor lenses which did not have the AI-indexing ridge built into them. This means that virtually any lens made from the early F mount lenses up to modern autofocus lenses (albeit without AF functionality) can be mated to the body. Warning: as is the case with most manual focus Nikons (except for the N6000), G lenses will not work properly on the FM. G lenses do not have an aperture ring. Using what have now come to be known as pre-Ai Nikkor lenses was accomplished this way: The photographer depressed a very small, round button on the left side of the lens mount area, and then flipped upward the small, chromed metal Ai coupling's aperture tab follower, which allowed lenses made prior to the Ai program to mount without damaging the spring-loaded Ai coupling follower. Metering at anything other than maximum lens aperture was accomplished by depressing the depth of field preview button with the right hand's middle finger to close the lens down to working aperture, and adjusting either the lens's aperture ring or the camera's shutter speed dial, or both, until the LED display indicated the exposure desired. At maximum aperture, one would of course turn the shutter speed dial until the LED's were where one wished. Ai Nikkor lenses featured a small, secondary aperture scale with all the f/stops in white lettering, near the back of the lens. These small, white aperture settings were visible when looking through the viewfinder of the FM and FE (and FM-2 and FE-2 models that followed) in what Nikon termed ADR or Aperture Direct Readout, which only worked when there was enough light to make the readout visible. In poor lighting, it was often difficult, or impossible, to view the ADR info in the viewfinder. The film back is of a swing open design and can be opened by lifting the film rewind knob. Film is advanced one frame with a single stroke of the film advance lever. This lever is also a power switch as it switches the metering system. The film counter is an additive type and automatically resets when the film back is opened. The even numbers are number figures while the odd numbers are listed as dots. Frame numbers 0, 12, 20 and 36 are in red. To rewind the film depress the release button on the base of the camera. Flip out the crank on the rewind knob and rotate in the direction of the arrow. A memo holder is also on the back, this allow you to slip in a box tab or note as a reminder for emulsion type. There are two motor drive options available MD-11 and MD-12, that can advance the film at up to 3.5 frames per second. The motor drive MD-11 did not have an auto-off switch, and would often drain its eight 1.5-volt AA batteries if the unit was left on. The MD-12 was almost identical, but it would switch itself to a non-battery-draining sleep mode after a short period of non-activity, even if the MD-12's small ON/OF switch were accidentally left in the ON position. Many, many more MD-12 units were made than MD-11 units, and both units work with both FM and FE, and with later FM2 and FE2 cameras. Early production FM's had a knurled rotating collar/switch located concentrically around the shutter release button; this switch functioned as a shutter release lock when the camera was used alone; however, when either a Motor Drive MD-11 or MD-12 was attached, the switch was supposed to be turned after attaching the motor drive but BEFORE turning on the MD-11 or MD-12. Rotating this concentric switch to the ON position after the motor drive had been mounted and then turned ON would immediately lock up the camera, rendering the camera inoperable, and it was then necessary to remove the MD-11 or MD-11 from the camera base, and to touch the motor drive's exposed contacts with a penny to clear the jam caused by the out-of-synch camera/motor combination. Nikon FM's made after about 1979 or so dispensed with the rotating switch around the shutter release, and were not afflicted by this awkward mechanical/electric problem when using either MD-11 or MD-12 units. 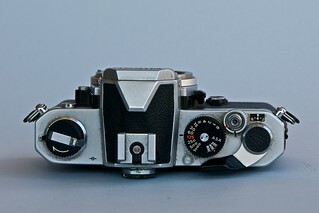 On these later production FM bodies, the shutter release lock was integrated into the film advance lever; quite logically, when the film advance lever was pressed close to the camera body's top deck, the shutter was locked,while pulling the advance lever away from the body disengaged the shutter lock. Later-production FM model which lacks the knurled ring around the shutter release, while the exploded diagram immediately below that photograph clearly shows an earlier FM which does have the knurled shutter release lock/motor drive interconnect switch. 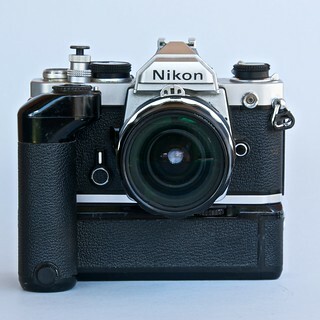 The Nikon FM fired at a respectable 3.5 frames per second (approximately) with an MD-11 or MD-12 motor attached, and was a workhorse camera that offered a smaller, lighter-weight, more-streamlined body than the fully professional F and F2 series bodies. Its shutter worked without any batteries or with dead batteries in the camera, and after removing the rotating shutter lock from around the shutter release, the FM became an almost bulletproof, very reliable camera that was not prone to hiccups or hitches. The FM's ability to mount and to meter with pre-Ai lenses was a very welcome addition during the late 1970's and early 1980's period. The camera balances very well with its motor drive added, and with the motor removed, is very small and compact and carries well. The camera has a front-mounted PC outlet, and does not need high-tech flash units--indeed, it pre-dated TTL flash, and did not perform TTL flash computations in any form, with any flash unit. X-synch was a respectable 1/125 second on all FM models. The FM was basic, simple, reliable, and well-engineered, and even with no batteries it would still shoot pictures, albeit without light metering functions. This page was last edited on 21 March 2019, at 01:19.